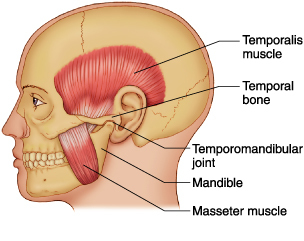 TMJ, or temporomandibular joint disorder, means that the hinge connecting the upper and lower jaw isn't working properly. This hinge is one of the most complex joints in the body, responsible for moving the lower jaw forward, backward and side-to-side. Any problem that prevents this complex system of muscles, ligaments, discs and bones from working as it should is called TMJ or neuromuscular dysfunction. Often, TMJ feels like your jaw is popping or clicking or even "getting stuck" for a moment. The exact cause of this misalignment is often impossible to determine. TMJ disorders have many signs and symptoms. It's often hard to know for sure if you have TMJ, because one or all of these symptoms can also be present for other problems. Dr. Munger can help make a proper diagnosis by taking a complete medical and dental history, conducting a clinical examination and taking appropriate X-rays. Learning relaxation techniques to help control muscle tension in the jaw. It may be suggested that you seek training or counseling to help eliminate stress and also include other physical medicine modalities. Dr. Munger studied extensively with Janet Travell, M.D. (personal physician to President Kennedy, particularly treating his myofascial pain condition) and with Larry Funt, DDS, M.S. in Washington, D.C. over a period of about 6 years. The course of study involved causes and possible solutions of myofascial pain (neuromuscular dysfunction), temporomandibular joint problems, headaches, neck aches, and other chronic pain conditions.